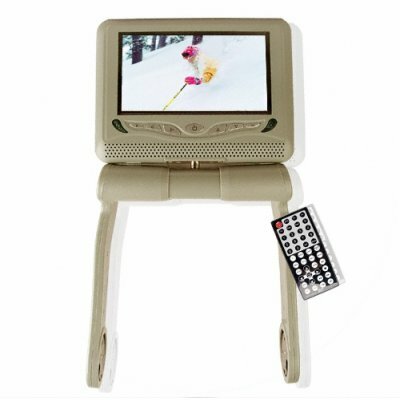 Successfully Added Touchscreen Armrest DVD Player - Bluetooth + iPod Connect -Tan to your Shopping Cart. Touchscreen Armrest DVD Player - Bluetooth + iPod Connect -Tan. Car armrest DVDs MP4 and iPod videos player with built in Bluetooth technology including A2DP and an incredibly large 7 Inch swiveling TFT LCD screen with full touch screen control. Make a real entertainment statement with this Chinavasion car media player. Some other astounding features include a FM transmitter for great sound direct from your cars own sound system, a USB port/ memory card reader/ iPod plug connection for playing portable digital media, and even a built in TV. With high tech features, a great design, and Chinavasion no M.O.Q. (no minimum order quantity) policy as well as one year warranty, this is one car DVD player system that is hard to beat!